Frank McCourt waited more than four decades to tell the story of his childhood, and it's been well worth the wait. With ''Angela's Ashes,'' he has [written] a book that redeems the pain of his early years with wit and compassion and grace. He has written a book that stands with ''The Liars Club'' by Mary Karr and Andre Aciman's ''Out of Egypt'' as a classic modern memoir. For the most part, [McCourt's] style is that of an Irish-American raconteur, honorably voluble and engaging. He is aware of his charm but doesn't disgracefully linger upon it. Induced by potent circumstances, he has told his story, and memorable it is. This memoir is an instant classic of the genre -- all the more remarkable for being the 66-year-old McCourt's first book. Frank McCourt's account of his deprived childhood manages to maintain humour, whilst not losing the pathos in the more tragic events in his childhood (including the loss of siblings and the absence of a feckless father). Although there has been some controversy regarding the veracity of these memoirs, I feel sure it is an accurate reflexion of the sort of conditions many experienced in Ireland in the early part of the 20th century. The brutality of the Catholic church (as well as some more compassionate moments), also rings true. I have wanted to read this book for a long time. It won the 1997 Pulitzer Prize for Biography & Autobiography. The first hour was torturously boring. Sadly, the book became more interesting as the tragedies started occurring. As a mom, I cannot fathom how Angela was able to get through the heartaches she had to endure. As a parent, I am equally appalled at how selfish Frank’s father was - how he could let his children go without because of his own selfish desires. It was particularly poignant to hear the story narrated by the author. I felt as though he was in the room, sitting beside me, tell me his story. I was not satisfied with the ending…I want to know what happens next! Frank had to beg, borrow, and steal to get to America; how did his behaviour change (or not) after he got there? Did he send money back to help out his mother and brothers? Did they stay in Ireland or come to America as well? Whatever happened to his father? I realize now that there is a sequel called ‘Tis, which I feel compelled to read. I watched the movie after reading the book, and I thought it was very well done and lived up to how I had pictured things in my mind. Wow. I look at my little children, who refuse to eat half the things I put in front of them just because the whim of the moment dictates that they don't like orange food, or that they would rather have peaches than grapes, or that they really wanted a PB&J instead of spaghetti. And here is this mother, in this book, watching her children literally die of starvation (and disease, and malnutrition, and whatever else is crawling around in the poverty they inhabit), and there is nothing she can do about it. Living in fleas, in filth, in actual unmitigated poverty of the kind I have never seen in this country, she does the very best she can, and you know what? So does the father. He is a scoundrel and a failure, but he is in a category of man with many others, and no matter how I tried, I could not hate him, because I felt he loved his chilren, and he always gave them his share of the food, and even though he drank every cent that ever came into his pocket, he was not to blame for their troubles. Angela's Ashes is driven by two strong questions. First, I know that Frank McCourt is now a famous author and a much lauded teacher, and so I know that he dragged himself out of it, through the typhoid and the starvation and the infections and rags, and out into a better place in the world. So the first question of the book is, How did that happen? The second question, implied by the title, is that the mother (Angela) will die. So how is that going to happen? That's the second question. The magic of this particular engine, this particular method of making me turn the pages, is that these questions are never overtly stated in the text, there isn't a "Now that I'm a teacher, I remember back when I was an urchin..." and we don't have any foreshadowing of the mother's death, or any foreshadowing of anything. Those questions that drove me insane with curiosity (How could he survive this? How could he?) were just buried in the fact that the book existed at all, and had that title. The other genius thing about this book is that the story has no "Now that I'm older and wiser and understand the world" type of context. Everything that happens in the story is filtered only through the consciousness of the main character at exactly that age in his life, whether it's that an angel brings babies and lays them on the stairs, or whether it's that the life of a messenger boy is the best he can hope for, or whether it's that devils will poke him with pitchforks for eternity, or whether it's one line of Shakespeare that infiltrates his education, we only see everything from right inside the character's point of view. Never the author, never the character later in life, only in the moment. Rather than making the facts of the book more palatable, because the character knows no better, this way of narrating the story actually makes it the more horrifying, because there's no author to step in and say, "And that's just how poor we were, that we had to burn the walls of our rooms, how sad, how dreadful." Which leaves the reader to think it. And there's no author to say, "And with that one line of Shakespeare, the whole possibility of language as art was lit up in me," it's left to the reader to discover that connection for himself. Everyone loved it. I read it & was disappointed, maybe because I'm not of Irish heritage? Has there ever been a worse life than Frank McCourt's? Certainly, if you were a slave on a Mississippi plantation in the 1850s or a Jewish resident of Auschwitz in the 1940s, you would say that McCourt had it pretty easy over in Ireland. Still, it's hard to deny the power of McCourt's memoir "Angela's Ashes" as he describes the hard-boned early years of his life in Limerick. I was deeply affected reading about the struggles of the McCourt family--father Malachy, mother Angela and children Frank, Malachy, Oliver, Eugene and Margaret. There has never been, nor will there ever be, as personal a portrait of poverty as this one. Life--in the form of the Irish addiction to a wee bit o' drink--has beaten down the elder Malachy until he is no longer able to provide for the family. Father flees to find work in England but neglects to send any money home, leaving his wife and children, already living in squalor, to further fend for themselves. They steal and beg and tear wood from the walls to burn in the stove. They get their nourishment from tea so weak it's just colored water. They live like sardines in a flat so miserable that every year they have to cram themselves into an upstairs room when winter floods and overflowing toilets make the place only half-habitable. The memoir--an astoundingly detailed recollection--is a series of vignettes of poverty, cruel schoolmasters, and disease and death. Frank survives (just barely) an existence so horrible that it would have given Dickens nightmares. "Angela's Ashes" would not be the phenomenal success it is without the poignant voice of Frank McCourt. Seldom have I read an author who can take me from tears to laughter in the same sentence. The prose is gritty, realistic and never self-pitying. "From October to April the walls of Limerick glistened with the damp. Clothes never dried: tweed and woolen coats housed living things, sometimes sprouted mysterious vegetations. In pubs, steam rose from damp bodies and garments to be inhaled with cigarette and pipe smoke laced with the stale fumes of spilled stout and whiskey and tinged with the odor of p*ss wafting in from the outdoor jakes where many a man puked up his week's wages." I'm sure the Limerick Tourist Association is not sending McCourt any love letters these days. Still, it's possible to see the author's nostalgic attachment to the city--if only as a benchmark of the place where he triumphed over bad luck, disease and indigence. "My father, Malachy McCourt, was born on a farm in Toome, County Antrim. Like his father before, he grew up wild, in trouble with the English, or the Irish, or both. He fought with the Old IRA and for some desperate act he wound up a fugitive with a price on his head. When I was a child I would look at my father, the thinning hair, the collapsing teeth, and wonder why anyone would give money for a head like that." The prose is never flowery or padded. It gallops forward in a breathless stream of consciousness that will have you alternately wanting to take it slow to savor each word, while rushing ahead to see what's next. To speed your eyes along the page, McCourt dispenses with quotation marks, like another favorite writer of mine, Cormac McCarthy. The style can be off-putting at first, but you'll soon find yourself rocking in the rhythm of his gentle Irish lilt. Save for the closing pages when Frank finally escapes Ireland and boards a boat for America, there is no relief from the grim, unrelenting struggle of this family. But McCourt always manages to find humor and joy even in the darkest hours. One of the best books I have read in a long time. McCourt has a way of making his repeated tragedies seem lovable and morbidly funny at the same time. This is a perfect example of the literary memoir. The Irish have an unbelievable ability to revel and rejoice in their sadness and hardships. This book is a classic example of that ability: it is heart-achingly sad, and yet still full of joy in sadness. Given the rave reviews, not to mention the Pulitzer Prize, Angela's Ashes was a disappointment. Certainly, McCourt's childhood was stunningly impoverished and miserable; I agree it is a "wonder how [he] survived at all." (11). But I found the read painfully long and slow. Thoroughly bleak tale of poverty in Ireland. Depressing but enjoyable, if that makes sense. I think my daughter read it first. I like this one better than Tis, but I think I always like the childhood parts of autobiographical books better than the grown up parts. On the other hand, it’s all told without complaint, and with humor in the pathos. The expressions and dialog are endearing. McCourt also has plenty of fond memories as well: reading in the library, going to the cinema to see American movies, getting an occasional bit of toffee, coming of age sexually, and getting his first jobs. The story spans the pre- and post-WWII period, but what’s happening in the rest of the world is distant, which is true to not only McCourt being a child, but to Ireland’s neutrality and conflicted feelings about the war, obviously not fond of England and benefitting economically with Hitler’s advances, sad to say. He’s honest about the things he himself is not proud of having done, and captures the ‘voice’ of childhood at various ages well. He also has just the right small touches of sentimentality for some of the people along the way, and when he leaves Ireland and his family behind in finally ‘escaping’ to America. Mam says, Alphie is enough. I’m worn out. That’s the end of it. No more children. Dad says, The good Catholic woman must perform her wifely duties and submit to her husband or face eternal damnation. “Frost is already whitening the fresh earth on the grave and I think of Theresa cold in the coffin, the red hair, the green eyes. I can’t understand the feelings going through me but I know that with all the people who died in the lanes around me and all the people who left I never had a pain like this in my heart and I hope I never will again. “One master will hit you if you don’t know that Eamon de Valera is the greatest man that ever lived. Another master will hit you if you don’t know that Michael Collins was the greatest man that ever lived. Mr. Benson hates America and you have to remember to hate America or he’ll hit you. Mr. O’Dea hates England and you have to remember to hate England or he’ll hit you. One of the hallmarks of a good memoir, for me, is the author's willingness to "bleed out" on the page. McCourt does, in a disconcertingly cheerful, matter-of-fact way. His revelations about his boyhood and is family are made more rending by his refusal to engage in self-pity. A terrific read. How do you tell a tale of a poverty-stricken upbringing with humor and grace? Frank McCourt does it in his memoir in a way that will keep you turning pages long after the last time you said to yourself, "I really must put this book down and get ... done." After the tragic loss of his 7-week-old sister Margaret, Frank's family (dad, mom, 3-year-old brother Malachy and 1-year-old twins Oliver and Eugene) moves back to Ireland when Frank is four. They are promptly turned away from their paternal grandparents' house and sent to Dublin, where they are told that Frank's father should be able to get some compensation for having fought for Ireland's cause. This turns out to be untrue, and, penniless, they end up at the police station, where only the kindness of the officers gives them the money they need to continue to their maternal grandmother's home. Frank's father is a drunkard from Northern Ireland who can't keep a job longer than the third paycheck, and even the dole money he is given when out of work winds up going to drink rather than to feeding his family. They live with fleas, in a unit that floods on the lower level, forcing them to spend much of their time upstairs. The reader finds out about the peculiar prejudice of the southern Irish against those of the North, easily distinguishable by their accents, and also about the injustice bred by poverty. We see Frank and his family going hungry while other families eat, and Frank wishing that someone else could be his mother simply because then he could always have mashed potatoes or soup. Siblings sicken and die, and his mother is shamefully reduced to begging for scraps to feed her children. Other fathers go to England to work, as does Frank's father, but, unlike the other fathers, no money is sent to his family. In spite of Frank's intelligence and the recommendation of his schoolmaster, Frank is turned away as an altar boy due to his poverty, and other doors are closed to him as well. In spite of it all, there is hope and laughter in this novel. There are people we want to punch, and people we want to hug. There is the small joy of having enough to buy a piece of candy or go to the movie, and the larger joy of sometimes having a full meal or a couple of coins in your pocket. This is a tug-at-your-heart, in your face look at a hardscrabble life that many of us couldn't imagine, written by someone who falls in love with the words of Shakespeare and with Wodehouse novels while recovering from typhoid fever in the hospital. It is a tale that all readers will love, and I highly recommend it for anyone's shelves. She says that if Dad's job lasts we'll get proper cups and maybe saucers and some day, with the help of God and His Blessed Mother, we'll have sheets on the bed and if we save a long time a blanket or two instead of those old coats which people must have left behind during the Great Famine. That dog is a right Hindu, so she is, and that's where I found her mother wandering around Bangalore. If ever you're getting a dog, Francis, make sure it's a Buddhist. Good-natured dogs, the Buddhists. Never, never get a Mahommedan. They'll eat you sleeping. Never a Catholic dog. They'll eat you every day including Fridays. A difficult read for those of us who have never been poor, who have had loving and helpful families, who have not had drug or alcohol addictions in the family. The style was different ... stream of consciousness. Quite realistic. Not enjoyable but important. I've owned this book for 10 years and repeatedly shied away from reading it. What a mistake. Within the first 3 pages it was obvious why Frank McCourt won the Pulitzer. Probably not quite worth all the hype it received, but amusing and interesting. Good Writing. That's the only good thing I can say about it. I found it depressing and sad; didn't get anything positive from it. An Irish man looks back on the first nineteen years of his life. I wasn't sure about this book at first. It's very, very raw. McCourt's style is stream-of-consciousness; he eschews quotation marks, tones down his punctuation and sticks mostly to the present tense. The narrative feels like it came straight out of someone's head. We get an unfiltered account of McCourt's life. We live each event right along with him. Slowly but surely, the book grew on me. I found myself becoming absorbed. I was eager to read onwards. The content is more than a little depressing, but McCourt tells his story with enough warmth and humor that I never felt overwhelmed by his family's difficulties. This story is the one of Frank McCourt’s, an Irish-American who was raised in Limerick, Ireland. It is his life story from his earliest memories in New York through his life in Ireland until he returns to America at age 19. His life was a remarkable one and I can’t imagine living through the hardships that he’s endured. He lived a childhood in extreme poverty and nearly died of typhoid fever. Frank suffers the loss of his twin brothers and little sister. Frank’s father is an alcoholic that causes his family to live in squalor as he spends any money he earns in the pub until it is gone. Frank’s story in Angela’s Ashes is one that contains so many unbelievable hardships, yet at the same time the reader is amazed by his resilience and continued fight to make something of his life and return to America. Lisa lent me this book and told me that it was one of her favorites. I can see why. 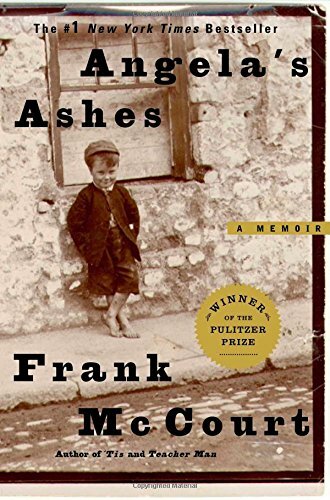 I have since learned that Frank McCourt received the Pulitzer Prize (1997) and National Book Critics Circle Award (1996) for Angela’s Ashes. He is also the author of ‘Tis, which continues the story of his life, picking up from the end of the Angela’s Ashes and focusing on life in America, and Teacher Man about his challenges as a teacher with his students. Reading this book was so overwhelming to me! Its tale was remarkable and I felt such a sense of gratefulness for the life that I’ve lived in comparison to Frank’s. I don’t know how it is that I had never heard of this book nor movie. To avoid spoilers for those who have not read this excellent book, I will instead share with you one of my favorite parts of the book. Frank has written a composition on the Lord entitled “Jesus and the Weather” for an assignment in school. He is instructed to read it aloud to the class. “This is my composition. I don’t think Jesus Who is Our Lord would have liked the weather in Limerick because it’s always raining and the Shannon keeps the whole city damp. My father says the Shannon is a killer river because it killed my two brothers. When you look at pictures of Jesus, He’s always wandering around ancient Israel in a sheet. It never rains there and you never hear of anyone coughing or getting consumption or anything like that and no one has a job there because all they do is stand around and eat manna and shake their fists and go to crucifixions. This book is written without quotation marks and is written in his true voice. There are many songs, poems and other such recitals within the book. There are so many endearing and wonderful things that Frank shares in the book that will stick within the confines of my mind for a lifetime. I only wish that I could meet him! What an amazing thing that would be. If you have not read this book, it needs to be added to your MUST READ list. This is a book that will enrich your spirit and make you feel so grateful for not only ever meal you eat, but for your health as well. It is simply an amazing book! The story takes place during the Depression era and immediately, the author dominates your emotions as he uses various symbolism and terminology as influential contributors in establishing the paralyzing mood of the story; a disheartening mood with injections of humor that somehow encourages hope and promise.